Mixing virtual digital synthesis with analog flair the Waldorf Blofeld is now including 64MB of sampling memory to truly create unique sound beds and leads. $999.99 Seen a lower price? 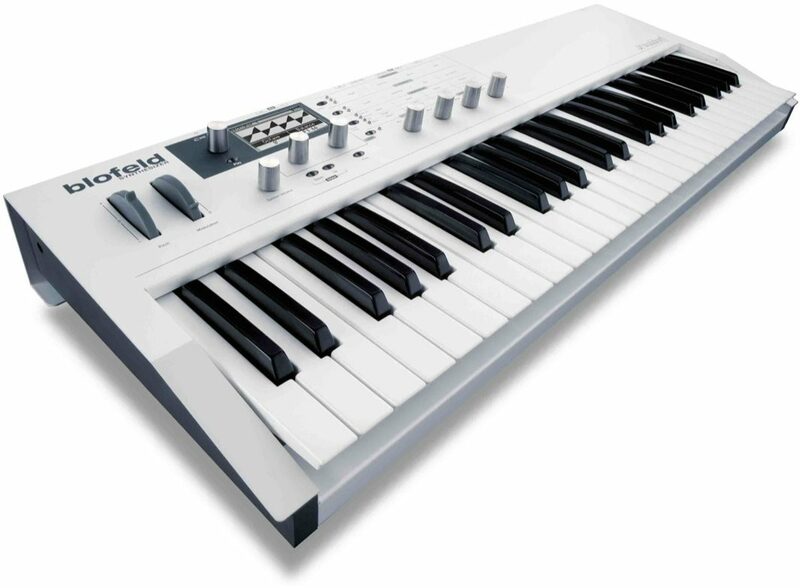 From Waldorf with love comes the 49-key Blofeld keyboard synthesizer. Besides its virtual-analog synthesis and classic wavetables, the Blofeld now sports a whopping 60 megabytes of sample memory. Add a vocal-like noise spectrum to a typical Wavetable pad, spice up a virtual-analog solo sound with a strong attack sample, or just process any other sample with the countless oscillator and filter modulations. Play your sound creations on the high-quality keyboard with velocity and aftertouch. The pitch bend and modulation wheel are at your disposal and of course, you can connect a sustain pedal. All this is packaged in a sleek metal enclosure with a big graphic display, endless stainless steel knobs, and an internal power supply. Each of the three oscillators offers authentic circuit-models of analog waveforms: Pulse with variable pulse-width, sawtooth, triangle and, as found in relatively few analog synthesizers these days, sine wave.Furthermore, oscillators 1 and 2 feature the two wavetables that were introduced by the Waldorf Q and appeared shortly thereafter in the Micro Q series. Not only that, the Blofeld includes all ROM Wavetables from the mighty flagship Waldorf Wave as well as Microwave II/XT. Plus, the desperately requested "Upper Wavetable" from the good old PPG Wave! For the first time in the history of Waldorf and PPG, each of these two oscillators can have its own wavetable. What's more, you have control over the brilliance of these wavetables -- especially important for waves with lots of harmonics in the bass end. You decide if you prefer pure and perfect harmonics or the same edgy timbre you know and love from the earlier Waldorf and PPG synthesizers. Brilliance also affects the sawtooth and pulse oscillator models. From warm and soft (for those typical L.A. string pads) to the hard shapes you need for punchy and biting bass sounds, Brilliance is not a simple filter applied after the oscillators -- the model itself is modified. Each of the three oscillators can be frequency-modulated by any of the other oscillators, the noise generator or one of the LFOs. With low FM amounts, you can add a little dirt to the oscillator sound, with higher amounts you get typical FM effects. On top of all that, oscillator 2 can be hard-synced to oscillator 3. Oscillators 1 and 2 can be ring-modulated to create bell-like or metallic sounds, eerie sound effects as well as pumping basses and leads. The noise generator delivers white noise that can be filtered low or high pass, depending on the Noise Colour setting. The three oscillators, the ring modulator and the noise generator can be freely mixed into filter 1 and filter 2. This allows fine control over the harmonic content of each of the tone generators. The Blofeld has two multimode filters per voice that can be routed in series or in parallel. Each Filter has its own Pan parameter for easy creation of stereo sounds. The selection of filter types includes low pass, band pass, high pass and notch (band reject), each with 12 dB/octave or 24 dB/octave slope. 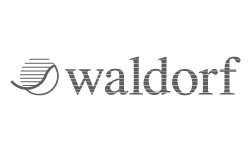 The filter models are based on several famous Waldorf filter algorithms found in all their products. They offer resonance up to self-oscillation as well as frequency modulation (filter FM). Furthermore, the Blofeld features the same comb filter types (with positive and negative feedback) that they first introduced in the Waldorf Q. These can be used to thicken bass and pad sounds or to create percussive, string or flute sounds reminiscent of physical modelling. Overdrive, Saturation, Distortion, Shaping...You name it. 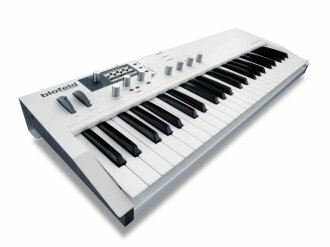 The Blofeld offers a freely controllable "Drive" behind each filter with more than a dozen curves. These include such standards as the drive from the Q and Micro Q, low/medium/hard saturation, tube saturation, two types of electric pickups, a rectifier, digital overflow as well as esoteric stuff such as "binary distortion", a sinusoidal waveshaper and even a distortion controlled by oscillator 1. And because the Blofeld has two filters that can be routed in series, you can control the timbre of the drive output of Filter 1 by dampening or emphasizing certain frequencies with filter 2. Four envelopes with different types and trigger modes affect any sound parameters you choose. Each envelope can be either polyphonic or single trigger. This is especially interesting with the monophonic voice allocation, as the filter envelope can be set to be triggered only by the first note(s) while the Amp Envelope is triggered anew (i.e. on each note). Think "organ percussion register", for instance. The Envelope types include the standard ADSR as well as an enhanced ADSR-variant (with controllable attack level and two decay and sustain stages), two different loop envelopes and a "one shot" Envelope. The Loop types can be used to act as additional LFOs, while the One Shot is perfectly suited for percussion sounds (which typically ignore the note release). Here's where the real Waldorf power lies. Each and every instrument designed and built by Waldorf lets you connect dozens of modulation sources to all the important sound generation parameters. Individual or multiple oscillator pitches, their pulsewidths and waveforms, their levels and filter-balances, FM modulation amounts, individual filter cutoff and resonance, filter FM amounts and stereo panning, or just the good old sound output level -- everything can be controlled from internal modulation sources or from a variety of MIDI messages such as velocity, keytrack, continuous controllers (including wheels, breath and foot controllers), etc. You can of course "modulate the modulators," i.e. control LFO speeds and individual envelope rates and levels. But in Blofeld, you can even specify that these sources modulate themselves -- recursive modulation! For instance, modulating an envelope rate by the same envelope (or another one) can alter the shape of the slope dramatically from the standard exponential curve to linear to inverse exponential. What if you want something really crazy, like controlling a pitch vibrato done by LFO 3 with the modulation wheel. Although there are a few such composite modulation sources such as "LFO1*MW" (LFO 1 controlled by Modulation Wheel) and "LFO2*Press" (LFO 2 controlled by monophonic Aftertouch), there's nobody doing the "LFO3*MW" thing for you. That's where the Modifiers come into play. In seconds you can set up a modifier, with the two sources set to LFO 3 and modulation wheel, and the "operation" set to "*" (multiply). You can use such custom-made modulation sources in any of the modulation slots described above. Each of the three LFOs offers sine, triangle, square and sawtooth waveforms, plus sample & hold and random. LFOs can be synchronized to MIDI clock, they can be polyphonic or monophonic, reset on key trigger to a freely definable phase, and the speed can be scaled by MIDI note (key follow). There are separate delay and fade in/out parameters for e.g. delayed vibrato (positive Fade values) or a burst of vibrato at the start of each note (negative Fade values). One important feature of the Blofeld LFOs is that higher rates reach well into the audio frequency range, thus making them useful extra FM sources. There are two basic modes: either linear FM as seen in classic digital synths, or logarithmic FM, which is primarily the domain of analog modular systems. The Blofeld arpeggiator features variable clock divisions from 1/64 triplets to more than 1000 bars, with variable swing/shuffle and a range of up to 10 octaves. This arpeggiator gives you up, down and alternate figures, selectable play order from low to high note, low to high velocity, as played or reversed, variable note length, different velocity modes, and Hold or One-Shot. Most importantly, it has a powerful Pattern Editor. You can set each Step to either play the note it would do so anyway, to pause, to play the previous note again, play the first or the last note, play those together, play a chord consisting of all held notes or a randomly selected note. Then you can adjust the Accent of each step (including silence), activate or deactivate Glide for each step, set the timing to play a step ahead or behind its nominal time, and finely adjust the note length between short staccato and full legato.